Special thanks to Uncle Tetsu's Cheesecake for extending this food review invitation. Besides the outlet at Summerton, Uncle Tetsu's Cheesecake (てつおじさんのチーズケーキ) has another outlet in Gurney Plaza. The kiosk is located at the Basement level, right next to an escalator and in front of Seoul Garden. As the name implies, this Japanese franchise bakery is popular for its Signature Cheesecake (焼きたてチーズケーキ). To date, there are 3 different flavors: Original, Chocolate and Earl Grey. 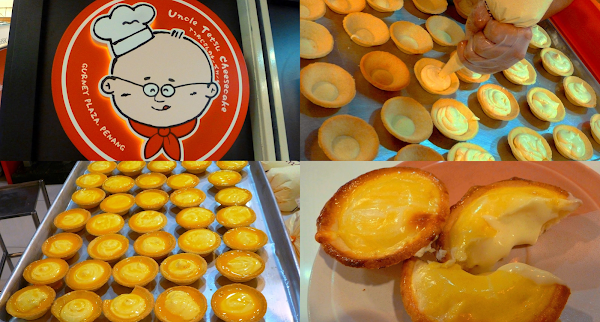 Just recently, Uncle Tetsu's added another item to its menu: Kurimi Cheesetart (クリーミーチーズタルト, RM4.50). The tarts are not Japanese in origin, but was developed and popularized in its Taiwanese stores. For the tart's base, the shortcrust pastry is made at the Summerton outlet. This outlet also serves as the central kitchen for all 3 Penang outlets (one more in Alma). Meanwhile, cream cheese is prepared locally at each location. The cream cheese is whisked so that it becomes lighter. Next, cream cheese is filled into shortcrust pastry crusts. This is followed by beaten egg yolk. Then, the tarts are baked in an oven for several minutes. Unlike the Signature Cheesecake, steam is not used during the baking process. Taken fresh from the oven, the aroma is lovely indeed. In terms of taste, the cheese filling provides mild tanginess while the shortcrust pastry is noticeably sweet. I think cheese-lovers should find the tarts to be satisfying. The tarts are best eaten when they are still hot. At this point, the cheese filling is still substantially runny. When left to cool, the emulsion starts to solidify. Some people may prefer this way. It is possible to refrigerate and reheat the tarts using a microwave oven, but the result is not as good as fresh ones. Due to overwhelming demand, Kurimi Cheesetart is limited to 6 pieces per customer. From now till 22 July 2016, customers who buy 5 pieces will get the 6th piece for free. Might as well because 6 pieces fit nicely in a takeout container. At food items at Uncle Tetsu's Cheesecake contain no meat, although cheese and egg may be included. This makes the food here suitable for ovo-lacto vegetarians. In addition, the restaurant is in the process of obtaining halal certification. Directions: Uncle Tetsu's Cheesecake is located at the Basement level of Gurney Plaza, in front of Seoul Garden and next to Sangkaya. Gurney Plaza has basement and multi-level parking garages.